Bread Boat (Baguette Boat) is a a whole new way to eanjoy scrambled eggs and bread. If you want to be extra, this recipe is for you. The quantities of all these ingredients can be varied to your taste and liking. You can use any other frying oil: sunflower oil, vegetable oils sold in Nigeria etc. 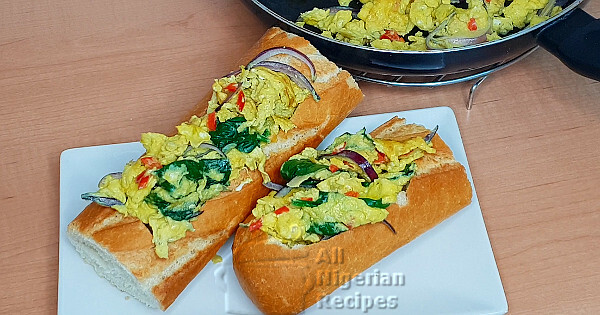 You can used an unsliced bread loaf like Agege bread instead of a baguette. Add the salt, black pepper, onions and spinach. Stir very well. Pour the olive oil in a frying pan and when it heats up, pour in the egg mix and spread it out. After about 20 seconds, stir the egg gently. Keep stiring from time to time till the egg cakes all over. You want bold scrambled eggs. Cut a long baguette bread into two. Make a hole in each one like you are making a boat. Fill up the hole with the scrambled eggs. Serve on its own with chilled fruit juice or hot chocolate.